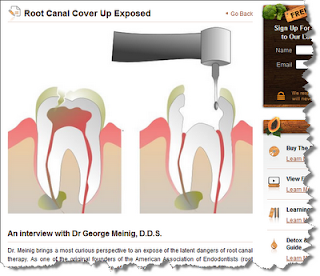 Phil, a regular reader of my Blog, sent me this link to an interview with a dentist, Dr George Meinig. "Dr. Meinig brings a most curious perspective to an expose of the latent dangers of root canal therapy. As one of the original founders of the American Association of Endodontists (root canal specialists) he's filled his share of root canals. And when he wasn't filling canals himself, he was teaching the technique to dentists across the country at weekend seminars and clinics. About two years ago, having recently retired, he decided to read all 1174 pages of the detailed research of Dr. Weston Price, (D.D.S). Dr. Meinig was startled and shocked. Here was valid documentation of systemic illnesses resulting from latent infections lingering in filled roots. He has since written a book, "Root Canal Cover-Up EXPOSED - Many Illnesses Result", and is devoting himself to radio, TV, and personal appearances before groups in an attempt to blow the whistle and alert the public of the dangers of root canal therapy." Rather than pretend to be an expert on root canal therapy, I invited a respected dentist to respond to the cover up claims of Dr Meinig. Although he wishes to remain anonymous, as most dentists do, I can assure you that this dentist knows what he is talking about. I think that the problem with these types of articles is that they seem to rely on the same bits of 'evidence' that have been around for many years,such as the Dr Price experiments, yet they do not bother to perform properly regulated scientific experiments to test their theories. I know of many cases where patients have arthritis or cardiac problems and no root canal therapies and vice versa, yet I don't suddenly generalise and come to unfounded 'scientific' conclusions. Often these radical conclusions are based on inuendo or one remarkable case. The intelligent next step is to test the observation scientifically as the only way to get a real perspective of things is to look at the evidence based on well done scientific studies. My understanding is that a properly done root canal therapy is bacteria free, but the correct chemicals and technique must be used. There is evidence that bacteria from the oral cavity can cause an endocarditis, but never the less this has to be kept in perspective and not generalised as Dr Menig has done. He is saying that any person who has a root canal is susceptible to arthritis or cardiac problems, but this definitely has not been substantiated. Even the more recent findings that there may be an association between perio disease and cardiac problems needs to be properly interpreted. What is the causative association? Is it just that people with perio problems have a life style that promotes both perio and cardiac problems or is it that inflammatory enzymes arising from perio then go on to cause cardiac problems. The answer to this question has not yet been found. My answer is that there are a lot of unknowns, but that it is dangerous for practitioners to set themselves up as authorities based on poor research and flimsy, scanty evidence based on 1 or 2 observations that are then used to make sweeping generalisations." Once dentists start writing books about the dangers of root canal therapy surely the dental profession would investigate with their own scientific studies - after all this is the domain of their expertise. I would like to think that there was some caring for my overall health and if there was any question of a link between bacteria in root canals and heart disease that they took it upon themselves to make sure they are "doing no harm." If there is a right way and wrong way to do root canals how can the average person know? My resonable hope is that when these questions arise (within their own ranks nonetheless) that as the 'experts' they would put the issue at rest through scientific study. The problem that I have is that the medical institutions (and I am not talking about the individuals who work for them) have become such large corparate structures ruled largely by market forces and are not motivated to change or question themselves by undertaking such an investigation.